Dr. Kasper grew up in Milwaukee and received her B.S. from UW-Milwaukee and her Ph. D. from McGill University in Montreal in 1965. She pursued a 10-year career in research in psychoneuroendocrinology and psychoneuroimmunology. This took her to interesting places such as Montreal, New York, New Orleans, Holland, Hungary, Norway and California. Research with heroin addicts for Dr. Hollister at Stanford gave her an opportunity to study clinical psychology at The California School of Professional Psychology. Her internship at the Fort Miley Veteran’s Administration Hospital in San Francisco emphasized psychotherapy, biofeedback and hypnosis for pain and stress management. By applying those techniques to the pain from her 1966 motorcycle accident, she got substantial relief after ten years of 24/7 pain. See her essay on pain. Phyllis moved to Montana to work on the forensic unit at Warm Springs State Hospital, where she evaluated people under arrest for ‘dangerousness to self or others’ for competency to stand trial. Phyllis in her former office. Dr. Kasper returned to Wisconsin to work as a community psychologist in Adams County. She was the only psychologist in the county and soon had to learn how to deal with just about anything in the realm of psychotherapy. She then pursued medical psychology at St. Francis Medical Center in La Crosse for six years. She moved briefly to Duluth, but decided to return to Wisconsin to be closer to family in Milwaukee. Phyllis then worked for Lutheran Social Services in Oshkosh and Sheboygan. Her next opportunity was with Dr. Charles Szyman at his pain clinic in Manitowoc. This connection allowed her to join psychiatrist Diana Lampsa, M.D. at Great Lakes Psychiatric Center in Manitowoc on the shores of Lake Michigan. This was a wonderful opportunity to work in a small, independent multidisciplinary mental health clinic with a team of incredible colleagues. The practice was purchased by Aurora Health Care. This gave Dr. Kasper an opportunity to use her extensive clinical skills as a therapist for Aurora Behavioral Health in Manitowoc and De Pere. Skills used to treat chronic pain, post-traumatic stress disorder, phobias, anxiety and depression can do wonders when used in healthy, goal-directed individuals who desire excellence. Techniques include hypnosis, Thought Field Therapy (TFT), Emotional Freedom Technique (EFT), biofeedback and EMDR (Eye Movement Desensitization and Reprocessing). For more on these techniques, please go to the Homepage and explore the links in the Articles section. These techniques need to be experienced personally in order to realize the depth of change they can produce. Since “retiring” from Aurora, Dr. Kasper joined an amazing group of therapists at Healthy Connections, LLC in Appleton, WI. 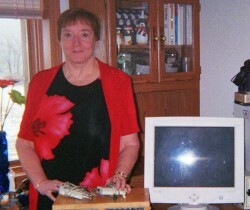 Starting in April 2012, she has been publishing monthly articles in Nature’s Pathways Magazine. On a personal level, Phyllis has long been interested in the traditional healing approaches of “pre-scientific” cultures. Meeting Blackwolf working at Lutheran Social Services in Oshkosh in 1990 began her journey into Ojibwe traditions, from the dramatic and powerful Sweatlodge to simple meditative approaches that can be practiced daily and taught to clients. Phyllis presented some of these approaches at meetings of the Wisconsin Psychological Association for Cultural Diversity continuing education credits. She studied Cosmic Healing with Master Mantak Chia in San Francisco. The course was sponsored by Dr. Angela Wu through San Francisco State University’s studies in Oriental Medicine. Most recently, Phyllis completed her certification as a Reiki Master Teacher with Amy Wilinski in Wisconsin. Please visit her current calendar of events.